A 3-year-old boy was fatally injured this week after authorities say he and a man were struck by a moving vehicle in a residential driveway on West Blosser Ranch Road. Pahrump Valley Fire Rescue Services and Nye County Sheriff’s deputies were dispatched Wednesday to the 2700 block of West Blosser Ranch Road, near Barney Street, at approximately 12:20 p.m. for a report of a motor vehicle versus pedestrian accident. PVFRS Fire Chief Scott Lewis said when crews arrived at the address they discovered two injured patients, one adult and one child. The young male was reportedly unresponsive and witnesses were giving the child CPR. The adult male was said to have been complaining of leg and back pain. Lewis said medics deemed the 3-year-old’s injuries warranted more advanced medical care and Mercy Air was called to transport the child by flight to University Medical Center in Las Vegas. 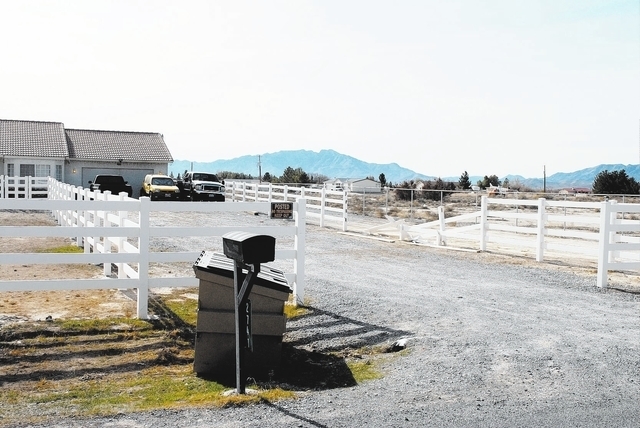 Sources tell the Pahrump Valley Times, however, that the child later succumbed to those injuries. The adult patient was transported locally to Desert View Hospital for treatment of his injuries. Police said an investigation into the cause of the accident revealed the child had been left in the running vehicle. At some point, the vehicle began to move and the adult male was reportedly struck and injured as he attempted to stop it. Police said the child attempted to get out of the moving vehicle and was struck and injured. As of press time Thursday neither the sheriff’s office nor the Clark County Coroner’s Office had released the name of the victim. Attempts to reach the boy’s family were also unsuccessful.